Rolex to Derby, what a week+! We are, The Horse Capitol of the World. I am not sure there is a bigger week in Kentucky that defines us as the Horse Capitol of the World like the 10 days from the start of Rolex through Saturday’s Kentucky Derby this year. There are a number of interesting factoids in regards to these two events. The Rolex Three-Day Event takes 4 days from Start to Finish, the Kentucky Derby is decided in 2 minutes plus or minus a few seconds. Both events are consider a leg of the Triple Crown in their respective sports. A number of successful Rolex horses are Thoroughbreds that started out as race horses and transitioned to Eventing. Generally Jockeys are short and only weighing about 100 pounds, Eventers tend to run the gambit on body size, William Fox-Pitt who won this year’s Rolex is something like 6′ 5″. The Rolex is in Lexington, The Derby in Louisville, two cities defined by Horses and Basketball both with a taste for Bourbon. Both events draw big crowds with significant economic impact both locally and on a State basis. The Derby does beat the Rolex in the area of TV coverage, 4 days of Rolex are turned into 1 hour of TV a week after the fact, where as the 2 minutes of the Derby equals many hours of live coverage across several channels. The obvious difference is that you can’t bet on the Rolex, well technically I guess you could, but who would want to, and if you do, you probably need to seek help. Another thing they have in common is that men and women compete equally and women are certainly a force to be reckoned with in the horse world, maybe more so there then anywhere else in business. I am sure that last sentence will draw some comments and I don’t have any scientific studies to back that up but feel pretty good about the validity of that statement. All of this is to make the point that we are The Horse Capitol of the World and that is a pretty cool thing, especially this time of the year. As the 2012 Olympic Games in London close, Gov. Steve Beshear today recognized the Kentucky Horse Park as an elite international equestrian facility for consistently hosting world-class and Olympic-caliber athletes. The Horse Park is also a significant economic contributor to the Commonwealth, with an estimated economic impact of approximately $180 million each year. 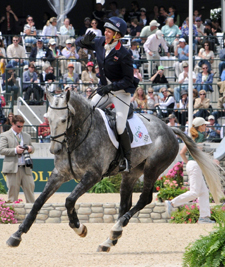 More than 115 athletes who participated in equestrian events in the 2012 Olympics have competed at the Kentucky Horse Park. Seventeen of those athletes earned a medal in the London Olympics. Athletes frequently travel from Australia, France, Great Britain and many other countries to the Lexington facility to contend for top honors in equestrian sports such as dressage, jumping and eventing. The Horse Park also hosted the 2010 Alltech FEI World Equestrian Games, which marked the first time the elite competition was held outside of Europe. That event placed Kentucky in the international spotlight and generated more than $200 million in economic impact, and also built on the park’s international reputation as a signature event site. The new facilities added to the Horse Park for WEG continue to attract competitors and tourists to Kentucky from across the country and around the world. The Kentucky Horse Park is a 1,200 acre competition facility and tourist attraction recognized as the epicenter of equestrian life, sports and business. Most notably, the park annually hosts the Rolex Kentucky Three-Day Event. The event is ranked at four stars, which is the highest level in international competition. The Horse Park hosts a number of other award-winning shows as well. The Alltech National Horse Show won the National Show Hunter Hall of Fame’s Show of the year. They were also named the top U.S. show by the North American Riders Group. North American Junior and Young Rider Championships and the two weeks of Kentucky Spring Hunter Jumper were named among the top 25 events in North America. This year, the facility will host 21 grand prix jumper classes as well as seven national or international hunter derbies, with more than $1 million offered in prize money. The Park will host three upper-level dressage events in 2013, including the U.S. Dressage Finals. For more information on the Kentucky Horse Park and its world-class events, please visit kyhorsepark.com. FRANKFORT, Ky. (Aug. 9, 2012) – Gov. Steve Beshear today announced his support for the federal Recreational Trails Program (RTP) by signing a letter to U.S. Transportation Sec. Ray LaHood reaffirming Kentucky’s commitment to utilize RTP funds. The RTP provides funding to states to develop and maintain recreational trails and trail-related facilities for both non-motorized and motorized recreational trail uses. Last month, Congress and President Obama reauthorized RTP funding with the passage and signing of the Federal Public Transportation Act of 2012. As part of the legislation, $85 million in annual funding is dedicated to states for the RTP. However, the legislation also contains a provision that allows state governors to opt out of the program funding. With this letter of support, Gov. Beshear officially states that Kentucky recognizes the importance of the RTP and opposes any efforts to opt out of the program. The RTP is funded by the U.S. Department of Transportation’s Federal Highway Administration. Kentucky’s RTP grants are administered by DLG and require that applicants match the amount of funds requested. The grants may be used to provide assistance for acquisition of easements; development and/or maintenance of recreational trails; and trailhead facilities for both motorized and non-motorized use. In 2011, Kentucky awarded $1.8 million in RTP grants to 38 applicants in communities across the Commonwealth to help fund hiking, cycling, horseback riding and other trails. For more info on Kentucky recreational trails and other adventure tourism efforts in the state, please visit http://www.kentuckytourism.com/outdoor_adventure/great_outdoors.aspx. Follow Governor Beshear on Twitter @Govstevebeshear, read the Governor’s personal notes on his blog at http://governor.ky.gov/blog, and view his video commentaries at http://www.youtube.com/governorbeshear. 1. Print out and fill out the Kentucky Proud Equine form. (link) This is a specially designed form just for equine farm applicants. 2. If you would also like to apply for a marketing grant through the Kentucky Proud program, also print and fill out the Kentucky Proud Grant Application. (link) This form can also be found at http://www.kyproud.com/Members/index.htm. You may apply for a marketing grant at a later time as well. As for the grant applications, those applications requesting less than $5,000 can be reviewed immediately. Those requesting more than $5,000 must be reviewed by the Kentucky Proud Executive Committee which meets once a month, generally the first Tuesday of each month. Any questions regarding the Kentucky Proud grant application should be directed to Mr. Bill Clary at bill.clary@ky.gov or 502-564-1137. Lexington, KY (October 6, 2011) — The Kentucky Department of Agriculture, the Kentucky Equine Education Project (KEEP), and the Kentucky Horse Council (KHC) announced today that horses have been added to the Kentucky Proud program. As new members of Kentucky Proud, horse farms in the Commonwealth will be eligible to receive financial grants from the state Department of Agriculture, will be eligible to participate in a cost-share program, and will be able to use the Kentucky Proud logo in advertising their equine products. The Kentucky Proud program was created to promote Kentucky-agricultural products. Over the years, the program has grown significantly and now includes businesses that support and sell Kentucky products as well as those that promote the concept of buying agricultural products from Kentucky. Formed in 1972, The Kentucky Horse Council is a nonprofit organization dedicated, through education and leadership, to the protection and development of the Kentucky equine community. For more information on KHC, visit www.kentuckyhorse.org, email info@kentuckyhorse.org or call 859-367-0509. KEEP was formed in May 2004 to promote and protect Kentucky’s horse industry. For more information on KEEP, visit www.horseswork.com, email info@horseswork.com or call 859-259-0007. To learn more about being a part of Kentucky Proud program, contact Cara Stewart with KEEP (cstewart@horseswork.com) or Ginny Grulke with KHC (director@kentuckyhorse.org). Kentucky Proud is the official farm marketing program of the Commonwealth of Kentucky. Kentucky Proud generated more than $200 million in retail sales of Kentucky farm products just through member retailers in 2010. More than 2,800 farmers, processors, retailers, restaurants, school districts, farmers’ markets, Kentucky state parks, and Kentucky Farm Bureau roadside markets are members of Kentucky Proud. For more information about Kentucky Proud, contact Bill Clary, Kentucky Proud program manager, at 502-564-1137 or bill.clary@ky.gov. Kentucky Proud Weekend and Gift Shop/Tack Shop Sale! A Celebration of Food, Family and Fun! LEXINGTON, KY (September 27, 2011) The Kentucky Horse Park will offer a Kentucky Proud Weekend and Gift Shop/Tack Shop Sale Oct 8-9, 2011, to celebrate some of the things that make Kentucky wonderful: our military, our horse industry, our music, our food and more! Kentucky Proud Weekend will be a great time for families to enjoy the park while getting a taste of Kentucky home-grown and home-made products. To make it even easier for families, children ages 12 and under will be admitted free of charge. – Plus all that the park offers on a daily basis, including live equine presentations, Hall of Champions, and much more! The Kentucky Classic Combined Driving Event will also be taking place that weekend. The Kentucky CDE is a competitive horse driving event made very popular during the Alltech FEI World Equestrian Games. Visitors will enjoy watching this great competition with their park admission. Visitors can also enjoy having lunch or a snack in the Kentucky Horse Park’s new Bit & Bridle Restaurant. For more information on Kentucky Proud Weekend, call our switchboard, 859-259-4200 or our Kentucky Horse Park Gift Shop, 859-259-4234. Park Hours and Rates: Through November 6, the park is open seven days a week. Admission is $16 for adults, $8 for children 7-12. From November 7 to March 14, the park is open Wednesdays through Sundays. Winter admission is $10 for adults and $5 for children ages 7-12. Children age 6 and under are always admitted free of charge. Admission includes the International Museum of the Horse – a Smithsonian Affiliate, and the American Saddlebred Museum and Gift Shop. I had the great opportunity to be a part of the Kentucky Horse Council Equine Industry Planning Session today at the Fayette County Extension Office. This was scheduled as an all day event starting at 8 AM so it was wonderful to see a solid group of close to 50 participants. This was a varied group across all areas of the horse industry from Thoroughbred breeders and members of several Equine Departments of our major Universities and Colleges to small local organizations like myself representing the Fort Harrod Back Country Horsemen. The facilitator was Colonel Walter Herd (Retired U.S. Army) who is also on the KHC Board. He did an excellent job and was very engaging which set a very positive tone for the day. The primary topics of discussion were coming up with ideas to bring Kentucky closer to that idea of a “haven for horses” that we all dream of by developing the “culture of the horse in Kentucky”. Ultimately in simple terms, we are the Horse Capital of the World, which is derived from the impact of the Thoroughbred Horse, how do we expand that definition to be all inclusive of everything Equine in the State or at least that was my take. I am not going to go into all the details because there was lots of great discussions and ideas. One tidbit I will report on, we did hear from a member of KEEP that the Kentucky Proud Program was being expanded to include horses and that specific program would be called Kentucky Bred. At the end of the day we voted on all of these and the KHC is going to digest those results and come up with an action list to start working on in November when they are planning on scheduling the next set of meetings. I will report on what comes out of those meetings as we get more concrete objectives to act on. State of the Games: Mid-way Point! The attendance totals for today are over 50,000 bringing the total for the Games after 8 days to just over 234,000 which is impressive when you figure at the start of September the ticket sales were not much more then that. This is an indication of what a lot of us thought, that because of the current economic recession(NBER be damned) that everyone is not wanting to lay down their hard earned cash until they are walking in the door. This also shows the strength of the silent majority in Kentucky that are horse people in comparison to a very negative and vocal minority that wanted to say these Games would be a failure. Now before I get accused of putting the cart before the horse (excuse the pun) , we are only at the halfway point, so I will not pronounce these Games a success from the financial point of view, that will take many months to say whether a number of the short term goals that were given in that regard were met, but from the stand point of Kentucky being able to put on these Games in a manner where everyone is having a great time, and that word is getting out, and the city is not being crippled while the Games are going on, I think we all can say these Games are going better at this point then any of us could of hoped. Now again, before anyone says I am just focusing on the things that are going well and I am not giving the total picture, I will say I have been out to the park 7 of the first 8 days and I have seen some situations were the planning did come up short. In one case I ended up right smack in the middle of a 30 minute oversight. I say 30 minute because that was the time difference between when an event was expected to end and when it really did but I can also tell you, that within an hour the negative impact caused by that had been eliminated because the staff and volunteers at the Games are a very flexible and resourceful group. So as I have said for a very long time, there is a magic with these Games that is very real and a lot of good will come out of these Games for Kentucky for a long time to come.